Horizon Diamonds is a third generation diamond wholesale company based in New York. Incorporated in 1975 as Karmily Gem Corporation, our midsized family business spent its first 15 years as a colored stone importer and dealer, establishing an inventory and servicing the local gem markets. Our company quickly gained a sterling reputation for our responsive and friendly service, and for maintaining the utmost integrity and professionalism in all of our relationships. In 1991, Horizon Diamonds was established and the direction of the business shifted from precious and semi-precious stones to diamonds. Over the past 25 years, Horizon Diamonds has serviced wholesalers and retailers throughout the industry and across the world, while steadfastly upholding our high values for honesty in every aspect of our business dealings. Our inventory consists of thousands of GIA and EGL certified, as well as non-certified diamonds. These range from .30ct to 15 carats and larger in all shapes, D-L color and FL-SI2 clarity. We also carry an extensive selection of matched pairs and suites in all shapes and sizes, as well as a beautiful display of GIA certified yellow diamonds, from light fancy yellow to fancy vivid yellow. We pride ourselves in our excellent makes: lively, impeccably cut diamonds with ideal proportions. With the constant arrival of imported shipments and deliveries from our cutting factories, our inventory turnover is very rapid. As a very competitive dealer in the always competitive New York diamond market, we adopt a “low-markup, high-volume” philosophy. Working on smaller margins has allowed our business to grow exponentially, as evidenced by our range from domestic to international sales in Canada, Europe, Asia and Australia. 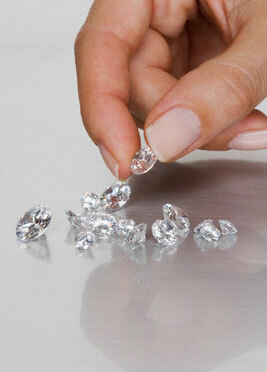 Horizon Diamonds is committed to supplying all of our customers in a timely and courteous manner. Feel free to call our offices at (800)933-4367 and experience the trademark service that has accompanied our name for over 40 years.